What’s the difference between a company that’s doing OK, and one that’s crashing through barriers? In business, it’s critical to adapt to and create change to stay ahead of the competition. When you foster a culture of innovation in the workplace, the payoff can be greater business achievement. It can’t just be the members of your leadership team who are tasked with coming up with ideas to do things better or faster. It requires a commitment and input from all levels of the company. Cultivating a workforce of innovators may be your business’s best growth strategy ever. Here are five things to keep in mind for fostering employee innovation. Does your organization have a culture of innovation? Can your employees come to you with ideas? Or do you regard questions and suggestions as disruptive? When employees have the opportunity to be innovative and contribute to your company’s mission and goals, it increases their level of engagement. They feel a part of a whole and see how their work moves the business forward. It’s a terrific motivator. And, who among us doesn’t want highly engaged employees? From attracting and retaining good employees to bottom-line productivity, employee engagement is like the brass ring of human resources. Your goal is to create an environment where sharing ideas is OK. Be receptive and appreciative of your employees’ interest and input. While every suggestion may not be something the organization takes on, the ideas are worth considering. Once you tap into the intellectual capital of your employees, you – and they – may be surprised at what you uncover. But you may find there are some who are reluctant to get involved; they’re likely afraid of failure or think their jobs aren’t innovative or creative. To pave the way for employees who are reluctant, consider having a group brainstorming session. Ground rules should dictate that there are no bad ideas. This is also where you make sure the more timid employees have an opportunity to participate. Consider having everyone write their ideas on index cards and tape them on the wall. That way the idea is the focus of attention – not the individual. This will provide the opportunity for all to share ideas, not just the superstars. But you can’t just stop at the brainstorming. To strike innovation gold, there’s the expectation that something needs to be done differently, faster or better. You have to give your team enough time, budget and encouragement to truly innovate. They need all three to be successful. Time is usually the one that gets short shrift. There’s never enough of it – we get embroiled in the daily to-dos and don’t consider future needs. This may require a sea change for your organization. Allowing time for brainstorming, research, testing, failure, recalibration and implementation is difficult. It takes commitment and planning. Innovation and creativity don’t happen without the investment of time. What can you do to provide the time needed to foster innovation in the workplace? Set aside weekly chunks of time for team discussions about what’s working or not working – and how it can be made better. Challenge your employees to help you overcome an obstacle with an inventive way of dealing with it. Split them into teams for a friendly competition on problem-solving. Offer training and development on creativity, change, teamwork and motivation. Embrace failure as just another step toward getting it right. When it becomes the norm to use critical-thinking, problem-solving and creativity in their daily work, your team will be ready to take on the monster challenges with finesse and innovation. As for budget, are there resources your team needs to be more creative? Are there enough computers for each person? Or, maybe everyone is in a cubicle, and it would help to turn a private office into a team meeting room. What’s it going to cost you to bring out the innovation on your team? Encouragement is the secret sauce in fostering innovation in the workplace. The first step is to make clear the company’s key objectives so that new ideas focus on what’s important for the organization. The next step is to make your workplace a safe place to take a risk. Remember, not everyone wants to speak up for fear of failure or rejection. But everyone has ideas – it may just take some time and practice to get them to share. For ongoing encouragement and learning, suggest books or articles on creativity and innovation to help employees find out how to tap into their own creative ideas. You also could have employees spend time job-shadowing someone in the company. It just might spur one of them to do their job differently to align better with company goals. Help your employees understand there can be innovation in positions that aren’t typically creative or innovative. Nearly every job can be done better or differently. If you’re open to hearing about it, your employees will likely embrace the opportunity to make a positive change. Most people are surprised at how innovative they can be, given a chance. Do they have the freedom to work in the style that suits them best? Ask yourself – and them: What atmosphere, schedule or process works best? How do they get work accomplished? As we’ve discussed in previous blogs on how various generations like to work, many employees are more comfortable working wherever they are, rather than the confines of a cubicle or office. They feel restricted – especially from an innovation perspective – if they’re required to sit at a certain desk for certain days of the week for a certain time. It’s largely because of generations Y and Z that organizations are reconsidering how employees get work done. We’re seeing more workweeks that include alternate days off, flexible schedules, longer workdays with more days off, varied start times, remote schedules, etc. While some businesses can’t afford to organize shifts based on employee preferences – customer needs take priority – some organizations can be more lenient on when employee productivity happens. When your employees are working at a time, place and pace that’s best for them, they’ll be more apt to offer creative and innovative ways for getting work done. And, if they feel they have the freedom to work in the way that’s best for them, they’ll likely feel more valued and be more engaged. Innovation can flourish, and your bottom line sees the result when productivity and employee engagement are at their peak. A side note: The perception that a company has an old-fashioned work structure may make it difficult to attract and retain employees. What is the design of your team? Is it a varied group? News flash: If you’ve hired like-minded people of similar experiences, backgrounds, skill sets, mindsets, age, etc., you’re on a path to innovation failure. For innovation to make a real difference, you need a variety of ideas. Take a fresh look at your team. If they’re all like you, make sure your next hire is somebody who breaks the mold. Then, listen to them. Innovation doesn’t work if you hire people with varied skills and experiences but insulate yourself from their ideas. Encourage your staff to experience new things, brush up on professional development and tap into what’s going on in your industry. When they learn about trends or new concepts through education, invite them to figure out how to incorporate those into their work. Find the right people for each task. This may be different than a job description. It’s about productivity and where their skill sets fit best. You can enhance your employees’ innovation when the skills and tasks align. Let’s say you’re trying to streamline your processes for greater efficiency. You might gather a group of workers together and charge them with finding ways to restructure the process. You could pick your top four superstars and turn them loose on the project. But take a moment to think about it: Is there someone whose natural bent can bring something different to the team? Someone you wouldn’t typically seek out for a special project? What about Joe? Although he usually stays in the background and lets other shine – because he believes there’s really no “innovation” or “creativity” in his job – you remember something: He’s the guy who reads math and statistics books for fun. Could Joe’s acumen be the catalyst for a new process at your company? Joe – who never thought innovation was part of his job description – is suddenly the company’s newest innovator. Given his success on this project, he’s ready to tackle the next challenge. You’ve just unleashed innovation in the workplace! Committing to fostering innovation in your organization is going to take time and effort. But when you can give a bit of direction then step aside and allow your employees more control to achieve goals and objectives, you open the door to greater possibilities. 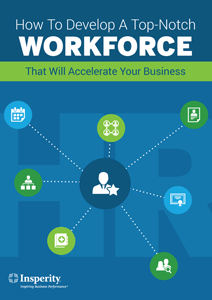 For more information about developing your employees into the workforce you envision, download our free e-book: How to develop a top-notch workforce that will accelerate your business.